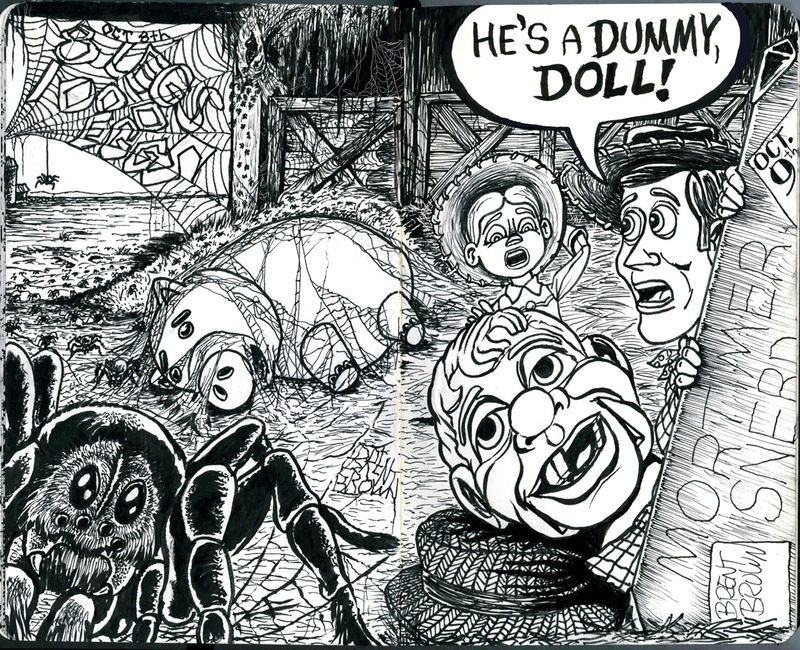 Days 8 and 9 of Drawlloween 2016 are: “Eight Legs, One Thousand Eggs” and “He’s a Dummy, Doll.” Trying to connect these two really specific prompts was a bit tricky. I decided to go with a “Charlotte’s Web” theme on the first, with all of Charlotte’s spider babies hatching out of the egg (I think spiders lay only one big egg sack, so I don’t know how accurate the “thousand eggs” bit is, but to be fair, they prompt never mentioned spiders) and webbing up poor Wilbur the pig. 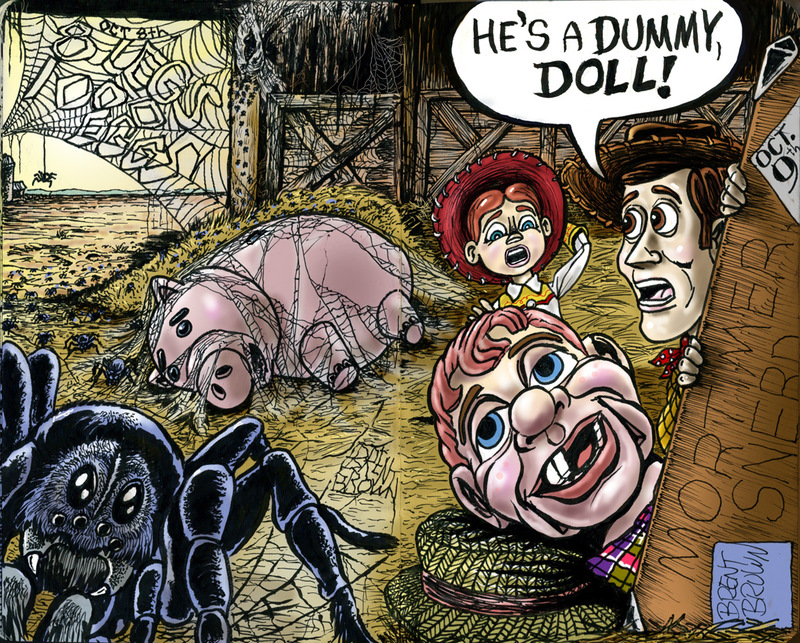 If you wondered why Wilbur looks like Hamm, the piggy bank from “Toy Story”, then you would be informed of the reason when I added the other characters from that Pixar/Disney movie: Jessie and Woody, the western dolls. 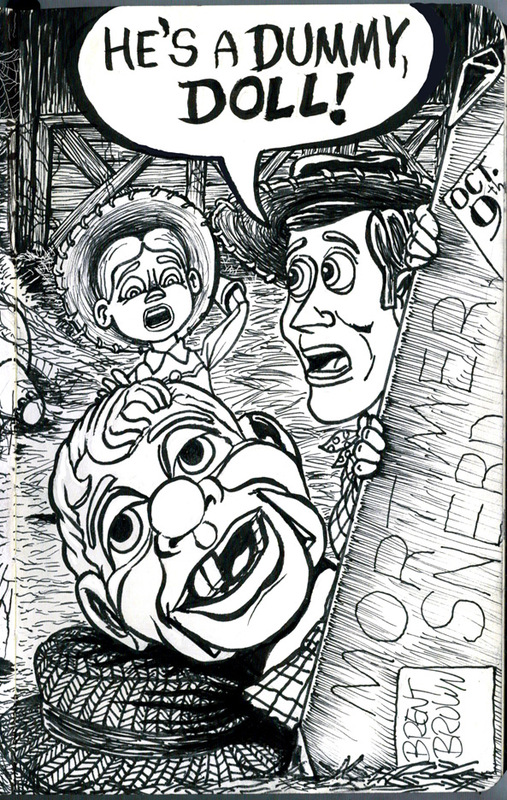 On day 9, they show up discovering a ventriloquist’s dummy who happens to be Edgar Bergen’s famous “Mortimer Snerd” character. Thus, the assigned phrase coming from Woody to Jessie now makes sense, and so does the fact that Hamm is the terrific pig that Charlotte wrote about in her web. Here they are combined in ink in the sketchbook, and then scanned in and colored digitally.